Sorry I've been away for a while. Taking a full-time job for the first time in eight years will do that to you. Anyway, school's out and so are the strawberries. Yesterday, after being inspired by the food section of the PPG about local strawberries, the kids (ages 7, 5 & 3) and I headed to Triple B Farm in Monogahela to pick our own. There were plenty of big, juicy strawberries, but there also were plenty of people arriving in a steady stream. "Pick your own" hours were 9-2, including a hay ride out to the strawberry field. Call for updated information about hours (724) 258-3557. If you bring your own containers, you can get a discount. They have some there if you don't have any. I can't tell you exactly how much the strawberries were, but your containers will be weighed and then you pay by the pound. They take credit cards. Our totals were confounded by our buying of fudge, pickles, cookies and "Pop's pop" at the Triple B farm store. Then we sat in the shade on their porch swing eating our goodies. Afterwards, the kids played on the playground (my 3 year old could sit on the tractor all day) and checked out the four-legged animals. I think they were mules, or perhaps they were ponies. I'm not sure. And tomorrow and Sunday they will be having a strawberry festival. We went there for the pumpkin festival in the fall and it was crazy busy. I imagine unless it is pouring rain (which it is supposed to), it will be the same Kennywood-like atmosphere. 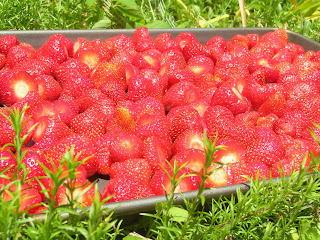 Other places are having strawberry festivals tomorrow including Soergel's in Wexford and Trax Farms . Still more places have "pick our own" hours including Janoski's Farm (out by the airport) and Paskorz Berry Farm in Cheswick. We went there last year. The berries were teeny-tiny, but the propieter blamed that on the lack of rain last year. There are no facilities there. It is a straight-up farm -- note the lack of website. And of course, after we picked about 15 pounds of berries (thanks to my industrious seven-year-old) we got two more quarts in our CSA from Harvest Valley Farms. So, I decided to freeze two trays worth to make jam, ice cream or sorbet as soon as I have a little time. You can get fresh-picked local strawberries from just about any farm store right now, I imagine. Let the tasteless California ones rot at Giant Eagle and enjoy a sweet/ tart juicy bit of heaven today.